CATCHING OUR BREATH. WHAT A WEEK! Whew! 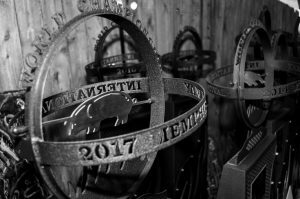 The 2017 Memphis in May World Championship Barbecue Cooking Contest (known around the BBQ circuit as Memphis in May or just MIM) is in the books! We had a crazy, intense and wonderful week, culminating in winning our fifth Whole Hog World Championship! 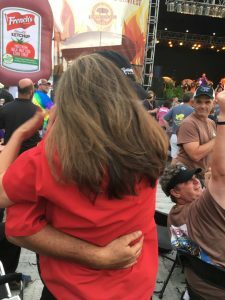 We have enjoyed competing at Memphis in May for 10 years and love every minute of it, even though it can be very taxing physically and emotionally. 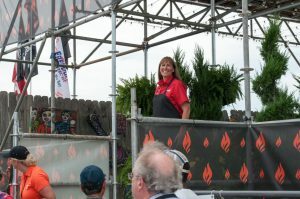 While this post is long, hopefully you will enjoy reading about our crazy Memphis in May World Championship Barbecue Cooking Contest experience and it will give you an idea of just how big this event is. May is our busiest month every year. Burning the candle on both ends doesn’t come close to describing it! It’s nonstop for the entire month, and not just for MIM. In the barbecue restaurant business, May is one of the busiest months — it’s National BBQ Month after all! Our catering department is booking and delivering events nonstop, the restaurants themselves are busier than average, and we have a lot of training as we grow our staff for the summer. Memphis in May just makes this all so much more intense. 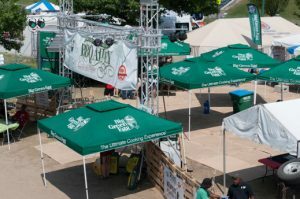 This year, MIM added an event called BBQ Alley, sponsored by Big Green Egg (highly recommended!). They invited us, two other restaurants and the Big Green Egg event team, led by our friend Ray “Dr. BBQ” Lampe. 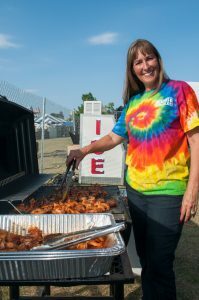 For a nominal cost, festival goers could go into an area and get samples of ribs, brisket, chicken and pulled pork. 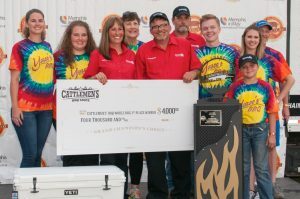 This was a needed addition, as the BBQ teams themselves aren’t allowed to distribute any food to the public, so if you don’t know someone on a team, you don’t get to try any barbecue. We cooked ribs, donated by the fine folks at Smithfield. Unfortunately, weather impacted the attendance this year, but we certainly hope the area will grow into a strong addition for Memphis in May. Memphis in May week kicks off on Mother’s Day, which is a top 5 sales day in our restaurants. So in addition to planning the deliveries, supplies, and staff for Memphis in May, we also have to make sure the restaurants are ready for a busy service. We were at STEAK by Melissa by 6 a.m. on Mother’s Day, and then we spent the day going back and forth between there and Memphis Barbecue Company before getting home around 9:45 that night. On the Monday and Tuesday after Mother’s Day, we ferry supplies down to MIM, set up our both, and go over last-minute details, while still making sure the restaurants are ready for the busy week ahead. This is just a very small portion of the tents looking out toward the Mississippi River bridge from the 2nd story of our competition site. 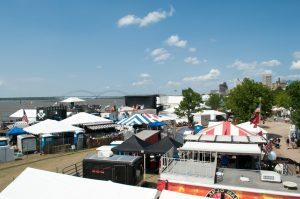 If you haven’t been to Memphis in May, bear in mind that it is an event like no other. Every year, we still get goosebumps when we go to the river and see what is basically a small city built on the banks of the Mississippi. Every trip down to the event site requires hours of loading, unloading and a lot of waiting (there’s one way into the park and one way out, and a lot of big teams, trucks and vendors trying to use the same small paths). On Wednesday, we go down in the morning and do final set-up of the booth area, then leave by 2 p.m. so we can pick up our hogs for the contest. 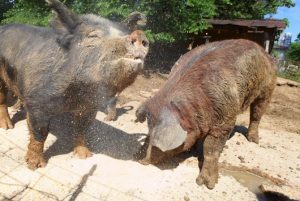 This year, we finally got to compete with what is now a three-year project: raising our own pigs (more on that here!). Then, it’s go home and make sauces and seasonings for the contest, pack up judging clothes and last-minute attire, and then try to get a little bit of rest as the next 3 days will be severely lacking in sleep. 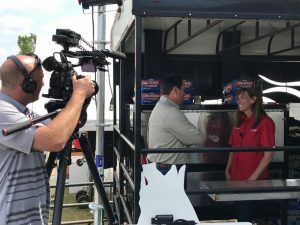 On Thursday, we had media interviews literally all day long, finally finishing up at 5 p.m. As we were hosting groups from my sponsors Smithfield, Tabasco and Kingsford in our booth that evening, my team was running all day long as well as getting ready for the event. For the dinner, we cooked several dishes, all using Smithfield Pork, with Tabasco to spice up the sauces or the items themselves. 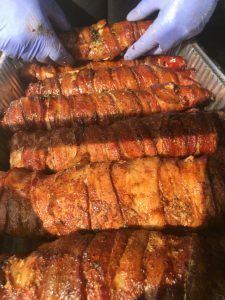 We served “Muddy” Baby Back Ribs, BBQ Pork Meatballs with a Tabasco Chipotle spiked sauce, Smithfield Pork Rinds with Chipotle Bold Dipping Sauce, Wild-Caught Gulf Shrimp with a Tabasco Original spiced Thai Chili sauce (so good!) and my Tenderloin Bacon Bombs glazed with a Tabasco Chipotle BBQ sauce. Friday started the competition for us (we cook our hogs for 24 hours, so we started them at noon), but it was actually a bit more relaxing of a day. 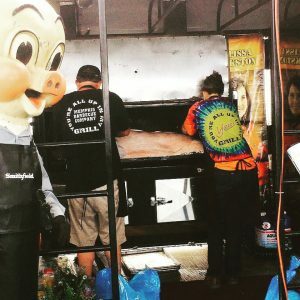 Our main focus was on preparing the hogs — getting them inspected, injected, seasoned and set up for the cook, and then resetting the booth for competition instead of hosting. I went home for a quick shower and then returned to keep an eye on things as the hogs progressed through the cooking process. Saturday is a whirlwind of a day. Our judging is at 12:15, so we build our day around that time. For example, we know we need to start pulling samples for the blind box at 11:40, which means we need to glaze the hog at 11, which means we need to select which hog we’re going to use for judging at 10:30, which means we need to hit proper doneness levels around 8 so the meat can go into a resting phase, which means we need to adjust my cooking temps around 1 a.m. in order to get over the “stall” in cooking a hog (more on that later as well) which means, well, you get the idea! 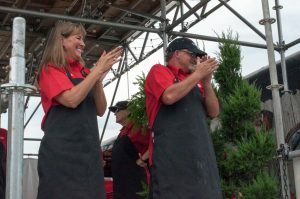 Judging at Memphis in May is a three-stage affair. First, you send in a “blind box” with meat samples. It is basically an unmarked to-go box, so the judges won’t know which team they are judging. Then, you get three judges who visit your booth individually (15-20 minutes apart) and you give them a presentation on your pits, your product, and your team. 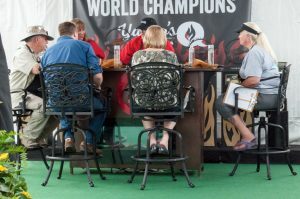 Scores are then tabulated for both the blind box and the on-site judges, and the top three teams in each category (Whole Hog, Shoulder and Ribs) make “finals,” where 4 judges visit all nine finalist teams and then rank the teams to determine the final scoring and the winner of the contest. The time your judges will arrive is assigned to you so you can get your product ready. We were first up, so we had 30 minutes before our judges arrived. Back to whirlwind time: get the plates ready, glaze the finals hog, garnish the cooker, breathe, make sure everything is clean, etc. We thought the samples for the judges were fantastic, even better than the preliminary round. At awards, I’m a nervous wreck, but luckily we win the Whole Hog category for the fifth time! Unbelievable! We didn’t quite make it to the Grand Championship (Congrats to Chris Lilly for that! ), but we were so proud to have won with those hogs. So, Memphis in May is not an easy contest. Months (years?) of planning, an incredible amount of work, and a whole lot of luck are required, at least on our part, in order to achieve success. But when a plan comes together, it’s worth it.